Effective costs £2.50 (£10-£5-£2.50 quidco bonus) after Quidco cashback. Otherwise £5 after TCB cashback. I think the op is including the current offer of an extra £2.50 when spending £5 or over through Quidco. I think the op is including the current offer of an extra £2.50 when …I think the op is including the current offer of an extra £2.50 when spending £5 or over through Quidco. Oh OK - I've already used that, so doesn't apply to me. £5 is still good though. no good for the 3 network. But voted hot. How can I make sure it's unlocked? Can't seem to find it specified anywhere. Or even just using the credit as bog standard PAYG. I was just wondering the same. I couldn't find an option to. do you get quidco on a free item ? Also, do credit topups count toward Quidco/TCB spends (seeing as the phone is technically 'free')? Are there any 3g variants of these phones, in a similar sort of price range? Top deal! Bought the phone itself for £16.50 from Amazon. On its way back and bought this. How can I make sure it's unlocked? Can't seem to find it specified …How can I make sure it's unlocked? Can't seem to find it specified anywhere. I need a payg sim for over Christmas so this seems a great deal for me. Does anyone know if the EE sim starts immediately or does it need to be activated? Does it last until credit expires or is there a time limit? Hi I am going abroad next month and was looking for a cheap phone. Sorry but this might be a daft question but is this genuinely unlocked and different simcards of different operators can be used? Does anyone know if the EE sim starts immediately or does it need to be …Does anyone know if the EE sim starts immediately or does it need to be activated? Does it last until credit expires or is there a time limit? It won't start until activated. You have to send a text message or make a call every 90 days. I believe that initially you have to buy one of their 'packs', but then any remaining credit doesn't expire as long as you meet the 90 day requirement. You can buy a £1 seven day pack, so £9 will remain as PAYG credit. They will send you a text message to remind you to use your 'phone. Once you have used the EE credit you can switch to a free Asda SIM, which also uses the EE network, and costs much less for calls and texts. See the PAYG comparison guides on the website Ken's Tech tips. I am a little confused about this. Does this mean the phone is free but you have to pay £10 each month for the phone calls/texts etc? I am a little confused about this. Does this mean the phone is free but …I am a little confused about this. Does this mean the phone is free but you have to pay £10 each month for the phone calls/texts etc? 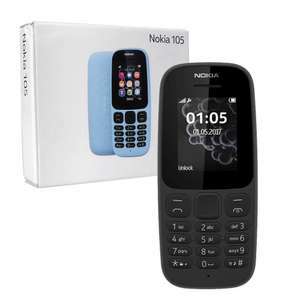 This Nokia has up to 35 days standby which is great! Also Nokia 3310 (2G) for £19.99 + £10 topup. This will be usually unlocked compared to O2 3G deal. Their iPhones are not ...... they lock to first sim used (so technically unlocked until you put a sim in, then they are locked) - cannot comment on other phones. Their iPhones are not ...... they lock to first sim used (so technically …Their iPhones are not ...... they lock to first sim used (so technically unlocked until you put a sim in, then they are locked) - cannot comment on other phones. Apparently they don't do that anymore either. Would I be able to buy this for my mum who is on contract with Asda? Thanks OP. Ordered and TCB £5 tracked in few mins. I think this is dual SIM, isn't it?Or at least that might explain why it …I think this is dual SIM, isn't it?Or at least that might explain why it has two signal strengths and SIM icons in the top status bar? It's a single SIM, wrong pic was attached, corrected.